Learn how to Successfully and Safely Develop the Advanced Yurchenko Vault Tony, Retrosis DVD, Yurchenko Progressions Part 2 Flipping continues the development of this extremely popular vault from his first video Yurchenko Progressions. He begins with drills to improve landings and cover how to improve the flipping and twisting elements of advanced twisting Yurchenkos. His explanations of all the drills are clear; and excellent demonstrations are performed by his team. This is a great video for any program beginning to train athletes to compete this very popular advanced vault. You must log in to share content from other websites with your friends. 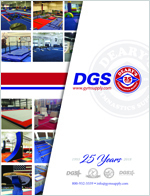 There is also new, up-to-date and exciting gymnastics news posted on the All Things Gymnastics Blog.